I am a proud member of the EDC (Every Day Carry) community. Quite simply, I get a kick out of knowing that whatever situation life throws at me I will have the tools to face it! However, what I am not a fan of are massively overloaded pockets. Of course, acquiring a card sized multi-tool which easily fits your wallet sounds like a reasonable solution, but they often don’t fit as well as they should (much like phone cases) and the overall build quality tends to be compromised for transportability sake. That is why I was excited to try out the Dango Tactical EDC Wallet. Why Even Buy a Wallet Multi-tool? Well, if you understand the EDC mindset, you are more than aware that having a single multi-tool in your pocket is way more practical than having heaps of them. Still, the most important thing is to have your wallet and multi-tool perfectly coexisting. When the multi-tool feels like an integral part of the wallet, you get the “Eureka” moment! If you are a fan of the great outdoors, enjoy hiking, camping, and traveling in general, having a properly designed and functional wallet multi-tool will most definitely change your experiences for the better. However, if you are just seeking for a macho/cool-looking, minimalist wallet and your everyday activities do not require you to be a handyman, you will probably be satisfied with a simple slim card case wallet. So, the question is – How do I make this decision easier on myself? Well, let’s try answering a few questions. Apart from occasionally opening bottles at parties, are you a frequent user of other tools that are not just a bottle opener? How much stuff does your wallet contain? If you are used to carrying a vast amount of business cards, credit cards, bills, coupons, licenses, etc., you are going to have a hard time adapting to the minimalistic nature of an EDC wallet. How worried are you about safety? Multi-tool wallets can often be used for protection purposes and some even protect your identities online (some wallet multi-tools like the Dango Tactical EDC provide you with RFID blocking). If we skip across the aesthetics and the incredibly appealing design of this wallet, we have to point specifically to how masterfully the multi-tool fits into it. 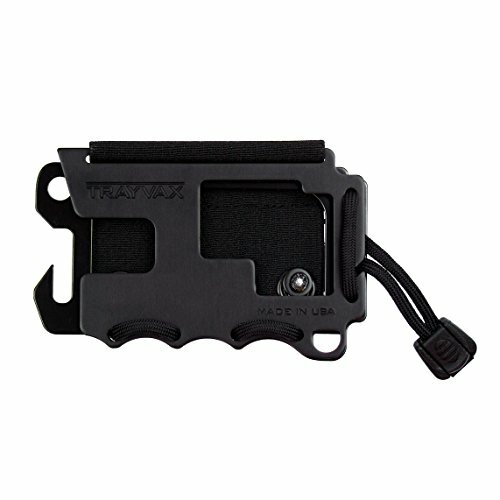 Because, unlike a lot of great wallet multi-tools out there, like the Trayvax Wallet, the Dango Tactical EDC allows you to remove the multi-tool from the wallet itself. If you are about to fly somewhere, but you are not looking to engage in any potential quarrels with TSA agents, this feature will most certainly come in handy. In case you fell in love with Dango Tactical Wallet’s design, but are not a huge fan of multi-tools, check out its multi-tool free little brother called the Dapper. I often have a hard time believing people when they say that they don’t care about style. Looks are important, get over it! The Dango Tactical is a prime example of this simple fact. If it came without a top grain leather pouch, it would look appealing, but not nearly as much as it does with it. Apart from being the perfect compartment for your driver’s license and business cards. The leather pouch gives a touch of class to the overall look of the wallet. Also, let’s not overlook the astounding, yet simple combination of leather and steel which creates the perfect balance between manliness and elegance. Where would I keep my cash, you may ask. Well, that’s what the extremely durable silicone band is made for. Let me ease your mind by saying that even a couple of singles are more than safely held by it! The leather pouch is fixed with stainless steel bolts to the Dango Tactical’s 6061 aerospace grade CNC’d aluminum frame. Now, this type of aluminum, apart from being incredibly sturdy, allows you to have a wallet which weighs no more than two ounces! Just a little hint, you can use the the frame itself as a bottle opener. The second aluminum part is the backplate. When you slide it into the slot on the back of the frame, you basically get a new metal pouch to store your credit cards in. The reason why the metal pouch is better for storing your credit cards is because of the RFID blocking it provides. No matter where you are, safety has to come first! There are basically two key questions that need to be addressed. What does the multi-tool include and how well does it work? The body of the multi-tool is built from heat treated CNC machined high carbon stainless steel. Almost every basic tool that you could end up needing is included in it. You get a bottle opener, ruler, grip handle with some knuckle clearance, smartphone stand, 10mm hex wrench, a 15 mm hex wrench, 1/4 hex wrench, flat head screwdriver, nail puller (wow), secure strap, knife, serrated saw edge, ring hole, and a rope tensioner! Quite frankly, I have used the bottle opener the most, but I have had the opportunity to test out the knife and the saw as well. The silicone band and leather body of the wallet provide a comfortable grip, so using them is even easier than I first imagined it would be. Truthfully, I was expecting to be faced with at least a couple of troublesome features. Given the fact that we are talking about an EDC multi-tool, nuisances have to be all over the place. Surprisingly though, everything seems to fall right into place with this one. When you are in need of the multi-tool, you simply pull it up in order to detach it from the bottom safety cavity and lock it into the one above it. Now, your knife and saw are exposed and ready to be used. What about the grip, you may ask. Well, if you pull the multi-tool up once again and slide it into the third safety cavity, you get knuckle clearance between the knife/saw and the wallet’s body, thus allowing yourself to have a proper grip handle while cutting through stuff. So, it is fairly easy to access and use. The knife and the saw are sharp enough to be functional, but not as sharp to be able to easily cut through your fingers. Overall, the multi-tool feels and behaves pretty solid. If you are looking for a thorough explanation of how the multi-tool was made to be used, you can check out a great little instructional video recorded by the company’s co-founder and CEO. Check it out. I have spent some time on the internet trying to find other people’s opinions about this particular wallet. Is it really necessary to mention that I did not have to look for a long time? Obviously, a lot of people found this wallet multi-tool very appealing and intriguing, and to my pleasant surprise, a great deal of them had nothing but positive things to say about it! Here are the opinions of a few satisfied customers. In this day and age? Of course! We would be in a world of trouble if the market wasn’t as diverse as it currently is. I think that it would be fair to present you with at least three decent alternatives for the Dango Tactical EDC Wallet . Earlier in this review, I have already mentioned the Trayvax Original Wallet . Quite simply, it is the industry’s standard. The overall build quality is great, it comes with lifetime warranty, RFID blocking, as well as a pretty useful tool (bottle opener). To me personally, it looks like a proper military man’s wallet. 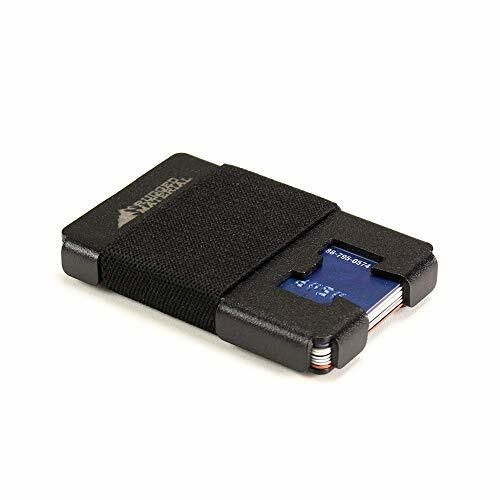 Compared to the Dango Tactical, it is more than $50 cheaper and can store two more credit cards, but your credit cards and cash are basically held together by a heat-resistant elastic Velcro. To me personally, that does not look or feel great. Also, the multi-tool is inseparable from the wallet, it is the wallet. Explain that to the TSA. Rugged Material really created a thing of beauty with their Ranger Minimalist Wallet . Not only is it well designed, but it is more than $50 cheaper than the Dango Tactical. Yes, it comes with 12 built-in tools, RFID blocking, lifetime warranty, it is durable and compact, but it really does have a major flaw which I am struggling to overcome. In order to use most of its built-in tools, you basically have to empty out the wallet. There is no way that you’d be able to use the bottle opener without damaging your credit cards. To me, that is a properly annoying feature. Nevertheless, a lot of people enjoy it and there lies the importance of product diversity! If you are a keen camper, there is really no need to spend more than $30-$50 on a multi-tool wallet, and that is when the Ranger Minimalist lends itself as being a decent option. If you are truly into minimalism, then you can’t go wrong with the Dakota Multi-Tool Money Clip . It has a stainless steel body, a simple clip which holds your cash and a couple of credit cards in place. In addition, it also holds 11 different tools among which are a wrench, ruler, flathead screwdriver, pry, etc. The price difference between the Dango Tactical and the Dakota Multi-Tool Money Clip is more than $70. However, that doesn’t mean that you don’t get good value for money with the cheaper item. 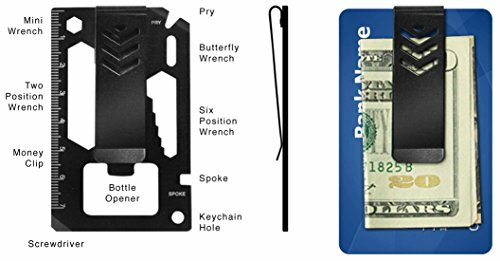 If you are on a tight budget or if you are looking for a decent present for your father, brother or even mother, the Dakota’s Multi-Tool Money Clip is definitely worth your attention! Not as sturdy as the higher-end multi-tools. 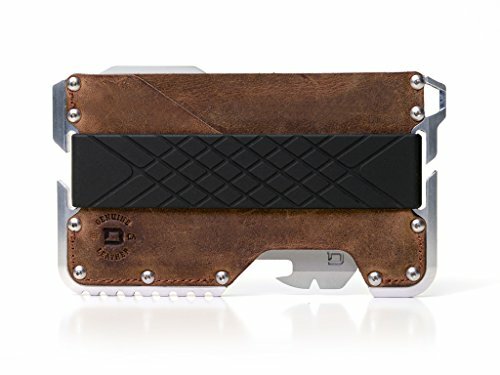 Multi Tool Money Clip-Stainless Steel Wallet With 11 Built In Tools, Including Bottle Opener, Wrench and Screwdriver. You can also take a look at Best Money Clip Wallets 2018 review to find more about money clips wallets. For me personally, it most definitely is. As an EDC enthusiast, a fan of minimalism, and a man who loves getting his hands dirty. I truly think that Dango nailed it with their Tactical EDC Wallet. I am finally able to have a properly built removable multi-tool that does not compromise my credit card space and slides beautifully into my wallet. Besides from providing me with more than 14 different tools to face any life situation with, it is durable, ergonomically designed, classy, and more than anything else, it’s practical. If you too are looking for a multi-tool that will last you a lifetime, as well as offer you protection (RFID protection), you might want to check out the Dango Tactical EDC Wallet.